He received his education in the US and finished with a Masters degree in Oriental Medicine and a Bachelor degree in Health Science. He is also a member of American Acupuncture Council. Kun was born and raised in China. Growing up in a family atmosphere with Chinese medicine, his family operated a clinic treating with both Chinese and Western medicine. His grandfather, both an MD and Chinese medicine doctor, practiced for 55 years. 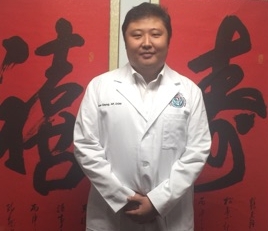 Kun was growing up and learning with his grandparents in the clinic, and by the age of nine, he was able to use some basic techniques of Chinese medicine to help treating patients under his grandfather’s supervise. Kun is thankful and respectful for his career and each patient who trusted him as his or her health provider. Kun believes he should experience his own needle technique before he treats someone else, and it is better way to learn how the needle really works on one’s body. He almost needled every acupuncture points he could reach, so he could perfect his needling technique and know what sensation it should be when it is working properly. The relieve of the patient’s symptom is what he considers successful, and the opportunities to make people healthier is what he is truly grateful.